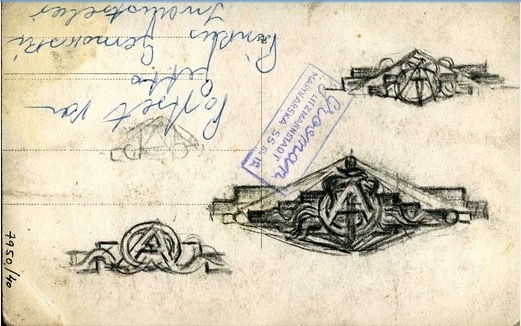 Sketches for an unknown purpose, perhaps incorporating the Greek characters Alpha and Omega, on the back of a photograph of a slain man, identified by a caption in Tobias Rozynès’s handwriting as the industrialist Pinkus Gernowski, likely Pinkus Gerszkowski 1876-1944. Yad Vashem Photo Archives, 7950/40. The card also bears an Ink stamp for the photographer: “[Mendel] Grosman, Litzmannstadt, Marynarska 55, m7.” Gift of Tobias Rozynès, Lyon, via Gérard Mayer.